It is deer season. Venison isn’t one of my favorite meats to eat but I will eat it if hubby brings one home. I try to cook the venison in spicy dishes so I don’t taste the wild taste as much. It usually works. We had some summer sausage made this time with jalapeno and cheese in it. It turned out really good. We got a lot of hamburger and I need to be creative, thinking of ways to cook it besides using it in chili and spaghetti. 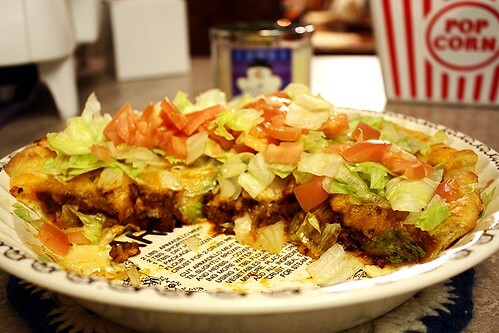 I decided to cook it in a Taco Pie. The seasonings are spicy and I never would have known I was eating deer. If you aren’t a fan of venison and have some meat, give this recipe and try. Heat oven to 375 degrees. Unroll dough, separate into triangles and place into an ungreased pie pan. Press over the bottom and up the sides to form the pie crust. Brown venison over medium heat, stirring occasionally, until thoroughly cooked. Stir in salsa and taco seasoning mix; simmer for 5 minutes. Spoon venison meat mixture into the crust-lined pan; top with cheese. Bake 15-18 minutes or until crust is deep golden brown and cheese is melted. Top with lettuce, tomato, salsa, and sour cream, as desired. Posted on November 7, 2013 by cookingwithpizazzPosted in Main Dishes, VenisonTagged Food, Main Dish, Recipe, Venison.